This Saturday, April 6th is the Solo & Ensemble Contest which involved all of the Illuminati, Bella Voce, and a some Principio students. 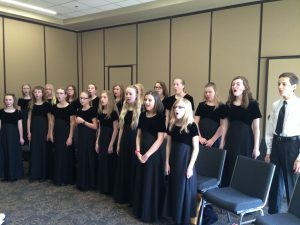 Your students’ Choral Director has relayed the the information for their ensemble arrival & warm-up time as well as the time in which their ensemble will be performing. If you are unsure of the time in which your student is performing, contact their Choral Director directly. Ensemble students are asked to wear their COHC Formal Concert Attire. All ensembles will perform in the Fellowship Hall at Edmond’s First Baptist Church (corner of Bryant and 33rd). Parents and students should use the South Entrance for this event. Family and friends are welcome to listen to the ensembles perform. Concessions will be available for purchase throughout the morning. A brief Ensemble awards ceremony will take place at 11am in the Fellowship Hall. The Ensemble awards ceremony concludes the ensemble portion of the day. Ensemble students are free to go at that time. During Ensemble Awards, all registered soloists will be competing in a separate room. Soloists will have a brief awards ceremony at 12:20pm. We have time slots for more parent volunteers to ensure this COHC event runs smoothly. If you can spare even 30 minutes during the morning, please contact Elizabeth Lopez at lopezvocalpiano@gmail.com.